Project Chaos features our most advanced UI to date while keeping with our philosophy that ease of use is king. With Project Chaos, you have access to 4 layers, each with their own advanced step sequencer, featuring per-step sub sequencers for volume, sample start, tuning and pan. Add to that our custom scripted modulation matrix featuring 2 LFOs and 2 Sequencers and the rhythmic possibilities are insane - and they've never been this easy to achieve. Using our Bank Manager tool, you are able to get your own samples imported and ready to be used and abused by our UI easier than it's ever been in any other Kontakt instrument. With Project Chaos, you are able to create what we are calling Chaos Banks. 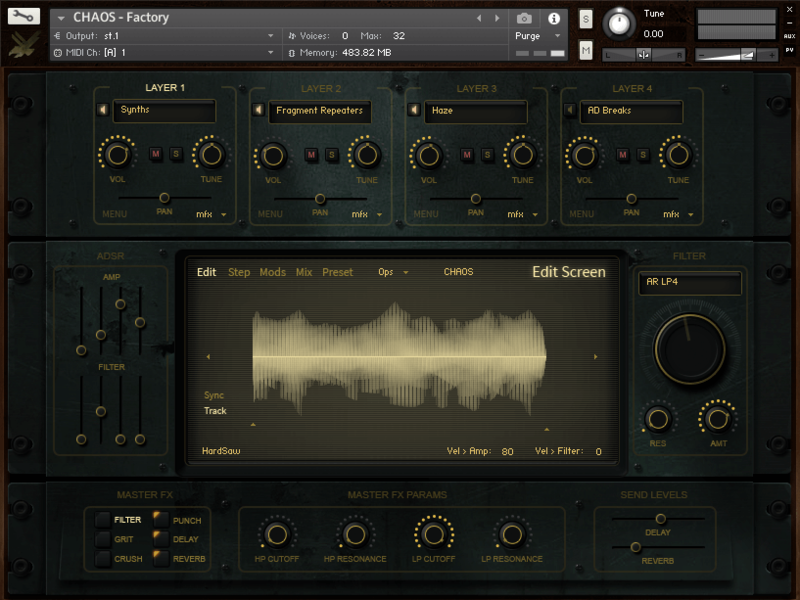 Chaos Banks are essentially self-contained instances of Project Chaos, each with their own set of up to 32 sample categories and their own set of 300 presets. For the first time, it's possible to truly make our instrument your own. Categories include AD Breaks, Analog Synth Loops, Chaos Drum Hits, Chaos Drum Loops, Distorted Bits, Downers, Drones & Textures, Drum Hits, Fragment Drones, Fragment Repeaters, Haze, Impacts, KickForce, Percussion Loops, Rhythm Low/Mid/High, Taps, Risers, Booms, Waveforms, Whooshes.